Martinez, , CA – The Contra Costa County Office of the District Attorney, along with District Attorneys from Alameda County and San Mateo County, announced today that Alameda County Superior Court Judge Morris Jacobson has ordered San Francisco Bay Area Rapid Transit District (BART) to pay $1.275 million as part of a settlement of a civil environmental prosecution alleging that the transit agency failed to implement hazardous materials business plans at facilities throughout the three counties as well as violating aboveground storage tank, underground storage tank, and hazardous waste laws. The judgment agreed to by BART, resolves allegations made in a civil enforcement lawsuit filed January 31, 2017 in Alameda County and covers environmental violations dating back to January 2010. The lawsuit claimed that at over 30 of BART’s 190 facilities throughout Alameda, Contra Costa, and San Mateo Counties, BART unlawfully failed to establish and implement a hazardous materials business plan for emergency response to a release or threatened release of hazardous materials. These hazardous materials included large quantities of diesel fuel, petroleum, sulfuric acid contained in industrial batteries, and fire extinguishing chemicals. The lawsuit further alleged that at these and other facilities, BART violated its environmental obligations related to its aboveground storage and underground storage of petroleum, and its hazardous waste. In January of 2014, during routine compliance inspections, hazardous materials inspectors from the Alameda County Department of Environmental Health observed large aboveground storage tanks containing diesel at BART facilities in East Dublin/Pleasanton, West Dublin, and Castro Valley. These tanks, which contained 500 to over 1,700 gallons of diesel, fueled backup generators and were located in close proximity to areas accessed by thousands of BART commuters each day. Despite the presence of large quantities of hazardous materials, BART had never implemented a hazardous materials business plan for any of these facilities as required by law. These plans contain critical emergency response information for first responders, such as firefighters, and BART employees, should there be a release or threatened release of hazardous materials into the environment. These hazardous materials business plans are designed to ensure the protection of the public and the environment in the event of a hazardous materials spill. The violations were brought to the attention of the Alameda County District Attorney’s Office Environmental Protection Division who then conducted a follow up investigation with the District Attorney’s Offices’ Environmental Protection Units of Contra Costa County and San Mateo County. The Contra Costa Health Services Hazardous Materials Program and San Mateo County Environmental Health Division also conducted inspections of all BART facilities in their respective Counties. The follow up investigations revealed that BART’s failure to implement hazardous materials business plans was more widespread and covered over 30 BART facilities in the three counties. The investigation also revealed that, at numerous other BART facilities, BART was committing violations of California’s aboveground storage tank, underground storage tank, and hazardous waste laws. BART was cooperative throughout the investigation and worked hard to bring their agency into substantial environmental compliance. During the investigation, BART hired an third party to conduct an audit of its environmental management programs and the audit identified areas of improvement related to hazardous materials, aboveground storage tanks, and hazardous waste. As part of the settlement, BART agreed to implement the recommendations from this audit. As part of the settlement, BART agreed to implement the recommendations from this audit. Under the settlement, BART must pay $675,000 in civil penalties paid out, according to statute, to other government agencies, and $300,000 to reimburse the costs of the investigation. As part of the settlement, BART must also commit $300,000 to an additional environmental compliance position, for a total of two such positions for the next two years. BART will also be bound under the terms of a permanent injunction prohibiting similar future violations of law. 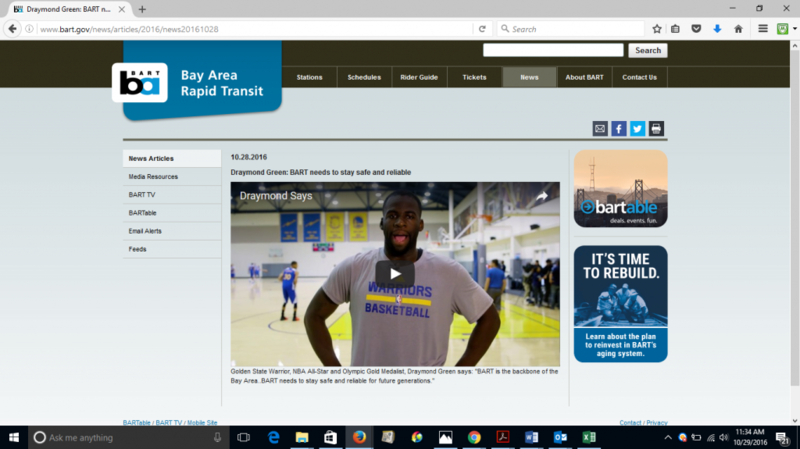 Screenshot of an ad featuring the Warriors’ Draymond Green supporting BART on the agency’s website, provided as evidence to support the complaint. Another campaign trick was played on Halloween, when Lafayette attorney Jason Bezis filed a complaint against BART for using public funds, on Monday, October 31st. He claims the government agency is using public funds to promote the bond Measure RR on the November ballot. Bezis then offers what he wants BART to basically admit they’re using public money to campaign for the ballot measure and to file the necessary finance reports for the expenditures. Bezis also provided evidence to support his complaint, which can be seen, below. “We have had an ongoing relationship with the Golden State Warriors for years at BART. We provide extra service to their games. They promote BART in a variety of ways, like this video, which they showed at one of their last pre-season games. We did not pay for it. The District absolutely did not pay for it. It’s the Warriors’ video and they used it for their pre-season game to show during the game. They let us use it for BARTable, which is a website and a newsletter that promotes off-peak ridership to various games, activities, shows and festivals. “I really want the Warriors to be applauded for encouraging people to take BART to the game and get cars off the road,” Hamill. “It’s a lot safer and smarter to take public transit to a game, when you’re going to drink and party. The FPPC has 14 days to decide if they intend to investigate the complaint, refer the complaint to another agency, take no action either because the Commission doesn’t have the authority or the allegations do not warrant any further action. The election is Tuesday, November 8th.